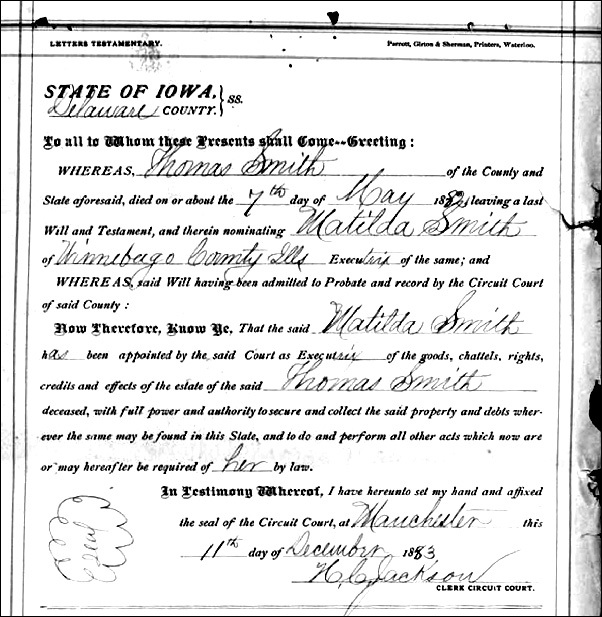 Probate records are among the best genealogical records that exist. When there is a will, it’s usually the case that the deceased names family members who are to receive his property after his death and does so with some indication of their relationship. When there isn’t a will, the law uses relationships to determine who’s eligible to receive the deceased’s property after his death and the mere fact that we can find out who got what will often tell us how people were related to each other. But there’s one hard fact about probates that The Legal Genealogist was reminded of last night, poking through court records again. The very best records may not always be where you expect them to be. 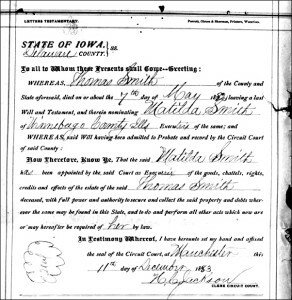 Matilda received letters testamentary in 1883 from the probate court in Delaware County, Iowa — but she didn’t live there. She was living, at that time, back in Winnebago County, Illinois.4 That’s where the family was enumerated in the 1880 census;5 it may be where her family was located. That’s where you get the rich detail about the land in Sections 25 and 26, Township 101 North, Range 49 West. With papers that began their journey in Illinois, from Matilda, and in Iowa, from Thomas and John. We need to chase those probate files down everywhere the deceased owned property — even if it means checking the records of three different states. Another ancestor moved from the location where she was living with her final husband to the location where one of her adult children lived after she was widowed but before the probate process. Consequently, there are records in both locations about her late husband’s estate and her inheritance. Happens all the time, Liz, whenever the deceased moved around and still owns property in more than one location. Good for you for knowing to chase that probate everywhere the records could be! I had a chance last week to try to chase a probate in far east Texas – those very early formed counties. Last week I visited the Panola County, Texas county clerk’s office in Carthage, Texas hoping to look at their probate records. You see, Panola County, unlike Shelby County next door where the courthouse burned in 1882, ACTUALLY has records beginning in the 1840s – a very important decade for early Texas research. Yes, I found lots of deeds and land records and early marriage records. When I inquired about probate records before 1900, first a few puzzled looks then finally was told they might be in the basement – of course down one of those courthouse death defying spiral stairs. So down there I found probate minutes beginning in 1846 and an entire wall of probate packet file drawers with mysterious numbers printed on the fronts. They apparently have no index to the files and no reference to the numbers on the drawers. Many of the first settlers to Texas had land across the area that is now Shelby, Rusk, Panola and Nacogdoches counties. These probate records are a gold mine for researchers and as far as I know the minute books have not been filmed nor has any of this information been indexed. There are books labeled “Final Records Estates” (starting with Volume A) and “Probate Minutes” (another set also starting with Volume A) that have been microfilmed from Panola County, and are on FamilySearch now, but it sure sounds like there’s a lot more! Terrific! other than “conveyance”Books? I know I should check Tax Records too, but the courthouse told me they would be in the Tax Office. I asked the Tax Office and they said the Probate Office had them. Please, where should I look. How do I find an index to old Will’s also. I’d strongly recommend getting a copy of the book by Christine Rose, Courthouse Research for Family Historians: Your Guide to Genealogical Treasures. It’ll give you loads of ideas of specific records to look for — and how to use them. My grandparents, three of her siblings, and her father all homesteaded on adjacent quarter sections in SD from 1907-1909. The properties were, of course, in the names of the men, except for one sister, who was still single and had her own. I have copies of all the certificates, signed by the president, showing that the land was theirs. In each case, they paid for the land up front, rather than living on it 5 years and getting it “free.” (There was always a small filing fee.) The five families ultimately ended up in MN and WA, left tenants to work the land. During the Depression, according to family stories, four families had to sell their lands. I don’t have the records for any of these, though I do have one rental agreement for my grandparents’ property from the early 1930s that turned up in their house when my grandfather died in 1975. So I know he and my grandmother had to have sold their land after that date. Where would I go to look for these property records, to find out exactly when each family sold the land, and whether it went to the state or a private party? The specific county courthouses in WA and MN, or in SD, where the land is? One family, who ended up in WA, managed to hang onto their land, and it’s now in the hands of descendants–a very elderly daughter, and two middle aged grandchildren. The daughter has half of the original quarter section, and her niece and nephew have a quarter each. Would the will designating this be in the county courthouse (presuming there is a will)? But in WA, where the owner resided at his death, or back in SD? Always always always look for land records in the deed books of the county where the land is located. Once land went from the federal or state government into private hands, every subsequent transfer of ownership should be in the county land records where the land is located.